I've wanted to start blogging again after a few years off. I was thrilled to find that I can blog using markdown in Vim and publish using git. This guide will show you how to use Github pages to set up a blog and how to publish your first post. If you don't already have a Github account, go ahead and sign up on http://github.com. Go ahead and fork the Jekyll Now repository. To fork simply click the link, and find the button that says "Fork". If necessary, choose where you want to fork the repository. This step is only required if you want to manage your blog from your local machine. Otherwise you can post directly from Github's site. To clone the repository (unix), first go to the directory that you want to hold the repo. I usually put things like this in a folder in my home directory called Developer. With the repository forked and renamed, now it's time to customize the details. To do this simply open up the file in the root level of the repo called _config.yml. You can edit this file right in Github or on your local machine if you've cloned the repository. Read through the file and change out all of the necessary settings. This file let's you customize things like your name, site description, social media links, etc. At this point you can customize or remove the About page. You can simply copy the about.md file and change the name. At this point you'll need to commit your changes (and push). You'll notice that the home page of your blog shows a post that you didn't write. The easiest way to write your first post is to edit this one. And then you'll want to change the text "Hello-World" to whatever you are going to call your first post. You'll see that the "Hello-World" portion of the file name is what will be used as the permalink. title: You're up and running! Keep the layout as post, but you can edit the title of the blog post. Below this is the body of the post written in markdown. You can edit this as you please. In order to publish, you'll need to commit (and push). Future posts can be added by creating a new file using the same format as the previous step. After you finish your post, remember to commit to master. If you're managing the blog from you computer, you'll need to commit and push. git commit -am "Added a blog post." Now that you've got your blog set up and understand the basics, you can start blogging, but make sure to take full advantage of all the features of markdown. 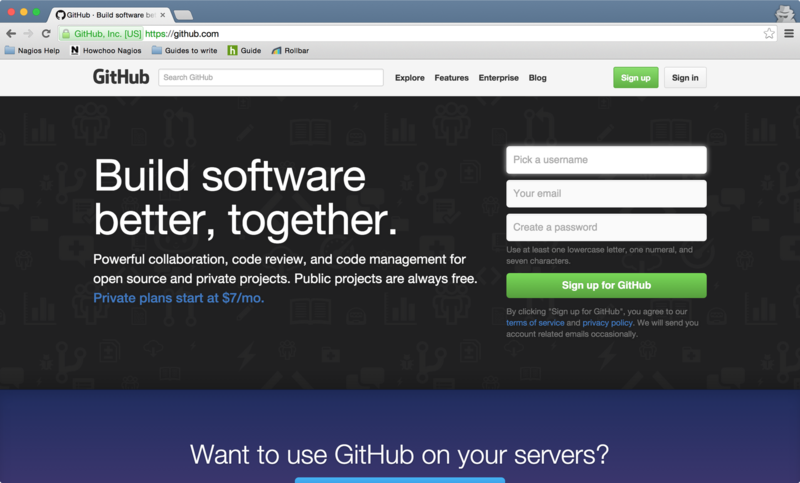 Git is an open-source version control system (VCS). In order to use Git to track changes in your code from the command line, you’ll need to download, install and configure it on your computer. Tab completion, or auto-completion, is essential if you're using Git on the command line. Tab completion is a nice feature of many shells that allows you to complete a word by hitting tab. When you're using git routinely, it's helpful to know which branch you're currently on without having to type git status or git branch.